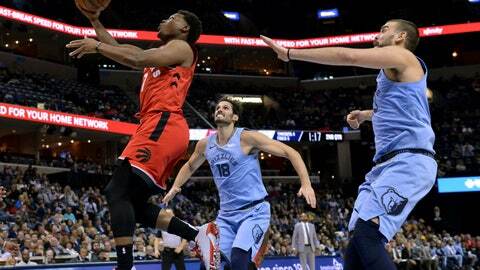 MEMPHIS, Tenn. (AP) — The Toronto Raptors were teetering on the edge of their winning streak ending, facing a 17-point, second-half deficit. Raptors: Jonas Valanciunas came off the bench for the seventh time this season. … Memphis led 32-31 after the first quarter, breaking a string of five straight games where Toronto led after the first. … Both Ibaka and coach Nick Nurse drew technical fouls in the last two minutes of the second quarter. … Toronto has won four straight and six of seven in the series. Grizzlies: Jaren Jackson Jr. became the fourth player in NBA history with at least 250 points, 20 steals, and 40 blocks in first 20 career games. The other three were David Robinson, Bill Walton and Patrick Ewing. … Lost consecutive home games for the first time this season. … Lost their third straight, the longest skid of the season. Gasol came up limping late in the fourth quarter after apparently rolling his ankle. The team didn’t release anything official after the game, saying medical personnel would evaluate him Wednesday.